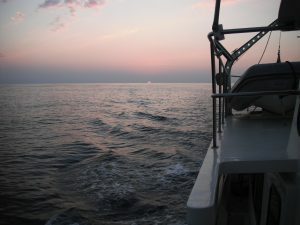 We’ve been underway since 2:00 p.m. yesterday, and are currently about 4 hours from our anchorage in Manzanillo, where we expect to arrive some time between 4:00 and 4:30 p.m.
Our principal weather sites, Magic Seaweed, PassageWeather, and BuoyWeather, indicated we’d have little to no wind, and very small swell today – and that conditions would begin deteriorating tomorrow. So off went the lines, and out we went, planning on a passage of about 27 hours to travel the 180 or so miles. So far it’s been a great trip…with no wind beyond the normal onshore/offshore daily pattern, and swells less than 2-3 feet. Last night we worried we were the last people on earth, as we saw nothing on the radar for hours at a time (fine by me). It’s been so quiet, as a matter of fact, that this morning until about 10:00 it was like glass…not a ripple on the water. There hasn’t been much in the way of sea life – but we’re noticing different birds here than just 400 miles south: Caspian terns, brown boobies, and the occasional gull cruise by to have a look at us. More often than not, we’ll identify the location of a sea turtle because we’ll see a bird standing on its back to rest. 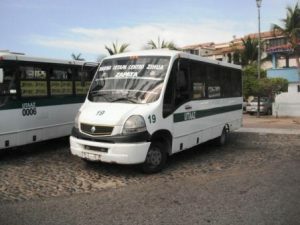 Today we decided to mount an excursion by bus to Zihuatanejo, just a short 10-minute, 9-peso bus ride away. 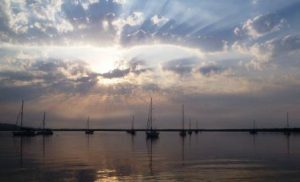 Neither of us had been ashore there since the mid-1980s, and we felt like an adventure. 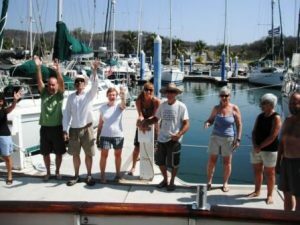 After a long day of doing absolutely nothing in Zihuatanejo Bay, we spent a night with zero wind – which means the swells had their way with us all night. 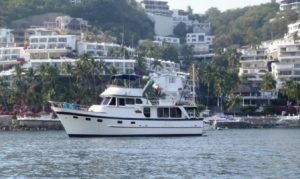 And since we’ve got to repair the anemometer (requiring a trip up a ladder to the top of the mast) and the galley hot water, we decided to move 5 miles along to Marina Ixtapa. We hadn’t even cleared Isla Roqueta off the entrance to Acapulco yesterday when we heard a mysterious bang (not the kind of thing you really look forward to hearing on a boat while you’re underway). After almost exactly 22 months, we finally threw off the lines and left Huatulco yesterday. 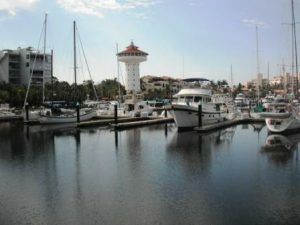 We’re sitting in the pilothouse enjoying the second day of a pleasant 235 miles of our first leg to Mazatlan – hoping to either anchor in Acapulco if we need rest, or complete another 110 miles and drop the hook in Zihuatenejo for a few days. As we prepare to leave, I thought I’d better jot down our impressions of this great little spot, for those that are following our journey and hope to call in here one day. Marina Chahue? Meh. Serviceable. That’s about the size of it. The showers and bathroom, in the words of a couple of ladies just finishing up a circumnavigation, are the third worst in the world. After a year of procrastination, we’ve finally upgraded our website platform from Front Page 2003 to Word Press! Those of you who’ve been waiting for new content have probably already given up on us — but we’ll try to be better at staying current, honest. All of our original cruise logs are still on the site in their original format, and can be reached by follwing this link: Emma Jo Cruise Logs 2007-2010. We’ll try to be better at updating the site, and we’re going to structure it so that the latest blog posts will appear on this page and titles and tags will show up in the sidebar over there on the left. We’re both well and healthy, and sitting at Marina Chahue in Huatulco, Mexico. 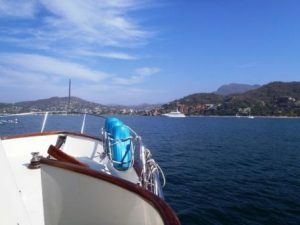 We’ve been here over a year, and will probably head north to Puerto Vallarta or Mazatlan in early 2012.